GoPro are amazing small cameras used by increasingly number of people to take awesome footage. 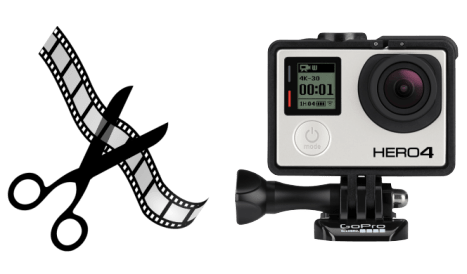 Before you share GoPro recorded videos with friends or upload to social sites, you will need to edit GoPro videos first to create your own mini movies. How to edit the action cam videos with highest quality and engaging effects? This tutorial will introduce you the best 4k/HD video editors for GoPro to create cool movies from your shot footage. How to Edit GoPro Videos with Highest Quality? Simple and powerful. Merge multiple GoPro recordings into one, cut unwanted parts, reduce GoPro 4K/HD video size, trim video, add subtitles/watermarks, convert videos into any codecs, adjust video quality and settings and do more. High quality reserved. Before you learn how to edit your 4k video footage captured from GoPro for further uploading to YouTube, FaceBook or Instagram, let's check the basic info on the videos recorded by GoPros. Videos recorded by GoPro cameras are in MP4 H.264 format. However, the latest GoPro Hero 6 capture 4K footages in HEVC, which means that some GoPro video editor will be unable to work with GoPro files. If so, convert the video formats or switch to another video edditor for your gopro footage. Videos recorded by GoPros are split into segments. For example, Hero 4 will cut the recording every 4GB, and earlier models support smaller sizes. How long is a video in 4GB? For instance, a 9-minute HD recording will fill up 4GB. In other words, to create your own film, your GoPro video editing tool should merge the 4-GB pieces together, while try to limit the file size for easier acceptance on mobiles or web sites. GoPro is able to shoot videos in high quality and high resolutions (up to 4K). But, those crisp images can be extremely large in size. Take the shooting times for Hero 4 cameras with 64GB SD card as an example, 2hr 56m recording in 4K resolution will occupy the 64GB storage. When you edit GoPro videos on Mac/PC, don't forget to reduce the video size to make GoPro allowable for YouTube, FaceBook or Instagram etc. To edit GoPro action cam videos for Instagram, YouTube, FaceBook, emails or mobiles, you will need a video editing software to guarantee the high-quality output files. For this purpose, you can try MacX Video Converter Pro. With basic video editing options for GoPro, you can cut unwanted parts of the image, trim the footage length, add subtitles or watermarks, merge multiple videos into one, tweak the video settings & parameters, compress GoPro 4K/HD video file size with high quality and do more, under its minimalistic interface. It will accept any videos from all GoPro cameras, including GoPro Hero 6, 5, 4, 3 etc. You can edit your GoPro footages for Instagram, YouTube, FaceBook, other webs, or iPhone, iPad, mobiles in ideal formats and settings. Free download the software on computer: Mac version (macOS Sierria incl.) or Windows version (Windows 10 supported). Then follow the tutorial on how to edit GoPro videos below. 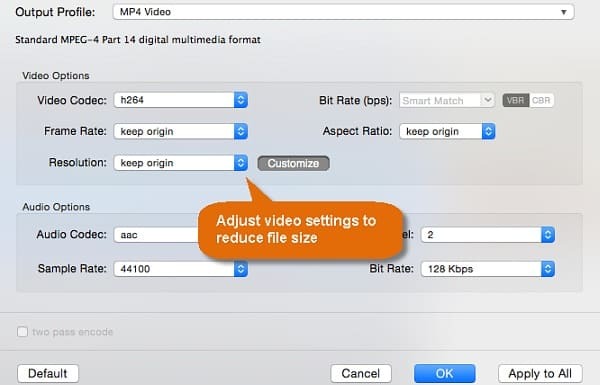 Launch the mp4 video editor and click the "Video" button to add the footage you'd like to edit. You can also drag and drop any videos from GoPro Hero 4/3/2 etc to the GoPro video editing software without worrying about the video format. Load all the GoPro segments into the software and toggle on the Merge button on the right and it will automatically merge the videos you just load. You can edit the basic info of the merged GoPro Hero 3 videos with the options available. By clicking the up and down arrows on the end of each video column you can change the sequence of the segments in the merged video. Click the Edit icon below each video to enter into the GoPro videos editing window. 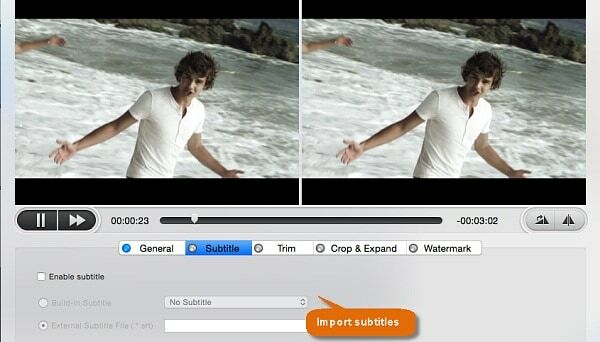 To cut any parts you don't want to have in the source video, click Crop & Expand button. You can drag your mouse to set the image area you'd like to leave, or set the exact position. You can adjust the aspect ratio to 16:9 or 4:3 etc for your mobiles. For many cases you may just need parts of the videos. If you want to remove any unwanted content at the beginning of the GoPro clips, at the end, or in the middle, click the Trim button. Check the Enable trimming box and set the starting and ending time of the section you'd like to have. You can also split GoPro mp4 videos into pieces this way. Note: if your GoPro mp4 videos is corrupted and can't be read by players or editors, this GoPro editing software will also help you cut the damaged parts and make the rest playable. To add subtitles to the GoPro 4K/HD video, check the Enable subtitle box and then click External Subtitle File and import the subtitles into GoPro videos. Note that the subtitles should be in .srt format. You can add watermarks with more personal effects. Click Watermark and then check the Enable watermark box. You can add any images or text as the watermark. 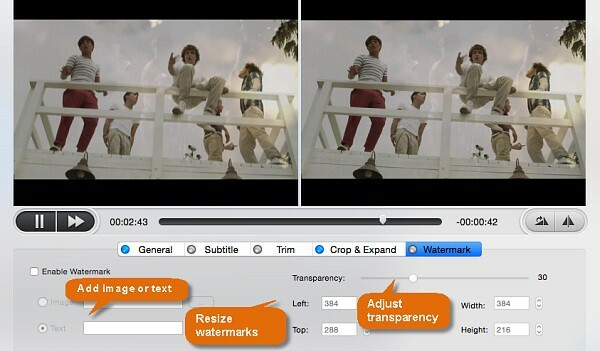 On the right side, you can resize the watermarks and adjust the transparency. BTW, the rotation icon at the right middle of the window can let you rotate Gopro video 90/180/270 degrees (also available to rotate iPhone video). 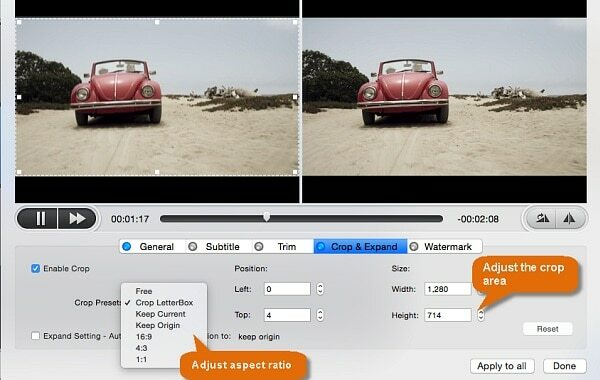 This Mac video editor will also help to reduce the file size of GoPro hd videos with high quality reserved. There are many ways to do this, for example, cropping unnecessary parts can reduce GoPro file size. Besides that, you can also compress GoPro videos mp4 into flv, wmv, 3gp format which comes with smaller size, or change 4K 2160P to 1080P resolution, adjust the frame rate or bit rate. After the GoPro video processing, you can export the edited videos. 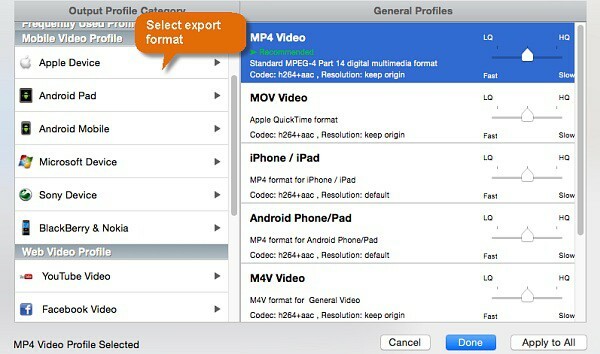 If YouTube, FaceBook, Instagram etc are the destinations where you'd like to put thevideos, you can convert GoPro MP4 videos into websites profiles; if you're going to play GoPro recording on mobiles, choose iPhone, iPad, Android devices from the list as the output option; or you can transcode the videos into avi, mov, wmv, flv, 3gp etc for other purposes. The above section is perfect for your GoPro video clip editing on your computer, below we will introduce you a few apps for editing GoPro videos on iPad, iPhone and Android devices. 1. Splice (iOS)- Splice is an app that makes it easy to touch up GoPro videos on iPhone iPad. It offers a slew of useful and user-friendly editing features to add background music at any point of the video, trim, cut and crop GoPro action cam videos, add filters, share GoPro video editing to Instagram, YouTube, FaceBook and more. 2. Quik (iOS)- Similar to Splice, this app for editing GoPro videos can satisfy most of your editing requirements. It has 26 video styles for you to choose from. Besides the basic editing features, you are allowed to add up to 80 free songs or music from iTunes library to the editing videos. The output videos are in HD 1080p or 720p quality. 4. WeVideo (Android & iOS)- WeVideo is another free app that can edit GoPro videos with ease. You can add special effects, titles, captions, music, emojis etc to the videos. This app is easy to use and has a large amount of user base. - compress GoPro 4K/HD video file size with high quality and smaller size. - transcode Gopro videos to be perfect for YouTube uploading or playback. For any questions with the GoPro video editing guide, please feel free to contact our support team.